Postcard publisher, Crawley. Robinson published some good quality black and white real photographic cards of Crawley, Slaugham and Handcross. The cars and styles of dress indicate that the photographs were taken in the late 1950s or early 1960s. A 1965 postmark has been found. 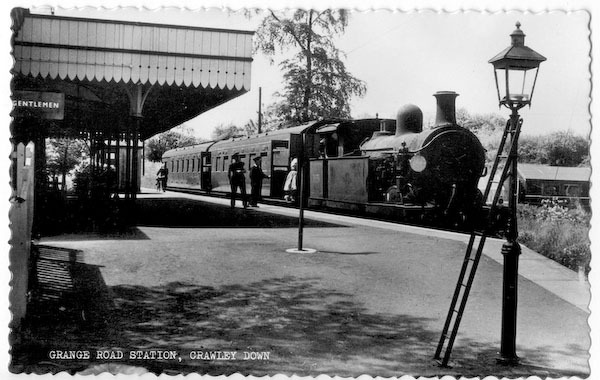 The card reproduced above shows an H class tank engine (ex South Eastern & Chatham Railway) heading a two-coach train from Three Bridges to Tunbridge Wells at Grange Road Station, Crawley Down. The last steam train ran in 1965 and the line was closed in January 1967. See also the entry for Johnson & Robinson.